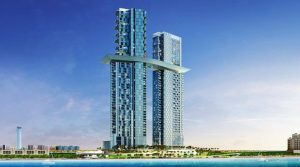 Dubai developer Nakheel has unveiled a new twin-tower hotel and residential project – Palm 360 – in its flagship Palm Jumeirah project. To be developed 220 metres above Palm Jumeirah, the project will offer all-round views of the island, the sea and the Dubai skyline. 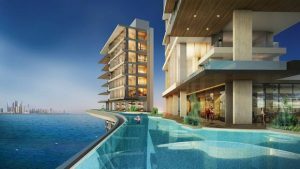 Located on Palm Jumeirah’s western crescent, the project is set in 500,000 square feet of landscaped ground and offers direct access to the beach and Palm Jumeirah Boardwalk. Residences include 252 high-end one and two bedroom serviced apartments. It also features 12 four bedroom ultra-lavish branded penthouses, including six covering an area of 12,000 sq ft – equivalent to the size of four tennis courts. Each occupying an entire floor – or two floors in the case of the duplexes – the penthouses offer facilities such as a private infinity pool, gymnasium and home theatre. The lowest penthouse is located 180 metres above ground while the highest is at 210 metres. Palm 360 also includes two boutique hotels with 110 rooms between them. 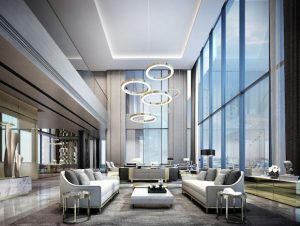 The hotels – occupying the first nine floors of each tower, including five floors of guestrooms and suites – will both feature an all-day restaurant, speciality restaurants, a luxury spa, health and fitness centre and a lobby-level indoor garden with floor to ceiling glass doors that will open onto a terrace during winter. 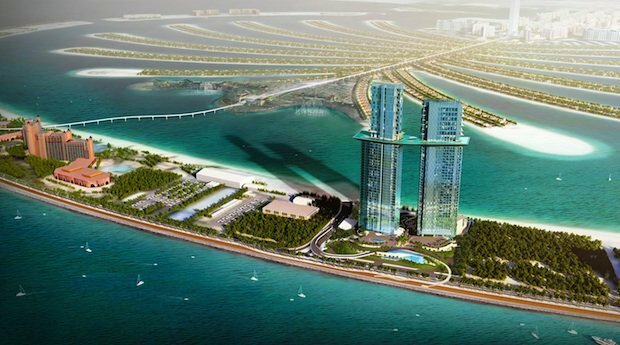 Discussions with potential operators are under way, Nakheel said. Palm 360’s features include a rooftop infinity sky pool and speciality restaurant complex connecting the two buildings at the 30th floor, more than 170 metres above ground. At 135 metres, the pool is longer than a football field, a statement said. There will also be two further pools located above a range of beachfront restaurants. The project will offer parking for 573 vehicles. Palm 360 is anticipated for delivery in mid-2020. Residences will be released for sale in due course, the statement said. 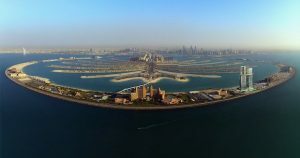 The company is currently working on other projects in Palm Jumeirah, including the 52-storey Palm Tower hotel and residential complex, Nakheel Mall, The Pointe, The Boardwalk and Palm Boulevard.